Hurricane Olivia's eye was clear in infrared imagery taken by NASA's Aqua satellite from its orbit in space. 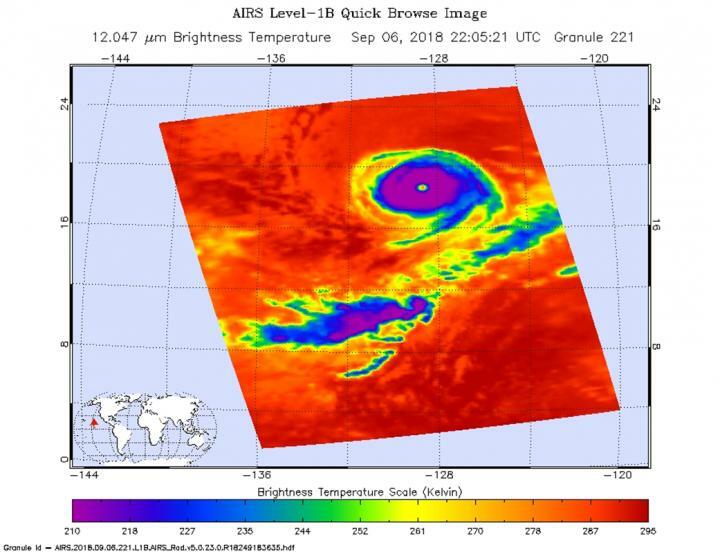 Infrared satellite data at 4:50 p.m. EDT (2205 UTC) on Sept. 6, from the instrument aboard NASA's Aqua satellite showed a clear image of Hurricane Olivia's eye surrounded by coldest cloud top temperatures near minus 63 degrees Fahrenheit (minus 53 degrees Celsius). NASA research has found that cloud top temperatures that cold have the capability to generate heavy rainfall. On Sept.7, Olivia's overall cloud structure in infrared and passive microwave satellite imagery has changed little since the previous advisory, except that the cloud tops have warmed significantly around the well-defined, 20-nautical-mile in diameter eye. At 5 a.m. EDT (0900 UTC) on Sept. 7 the National Hurricane Center or NHC noted the center of Hurricane Olivia was located near latitude 19.6 degrees north and longitude 131.2 degrees west. Olivia is moving toward the west-northwest near 15 mph (24 kph), and this general motion is forecast to continue through Saturday. A gradual turn toward the west is expected Saturday night or Sunday. Maximum sustained winds have decreased to near 125 mph (205 kph) with higher gusts. Olivia is a category 3 hurricane on the Saffir-Simpson Hurricane Wind Scale. NHC said "A slow weakening trend is expected through the weekend."